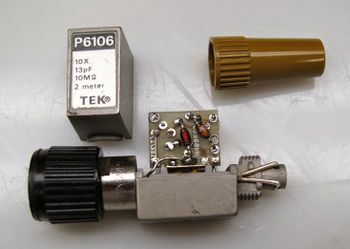 The Tektronix P6106 is a passive 250 MHz ×10 probe for 1 MΩ inputs. It was available with 1, 2 or 3 meters of probe cable. 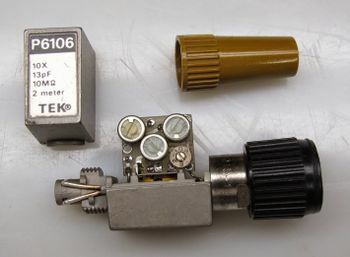 The 6106 has a coding pin for scope readout ×10. Color coding on socket tells, how long is their cable. Orange means 2m, Blue means 1m. >250 MHz (>150 MHz for 3 meter cable). Using the 1 meter probe with a scope having at least 325 MHz bandwidth results in a system bandwidth of 300 MHz typ. This page was last edited on 7 March 2019, at 10:57.